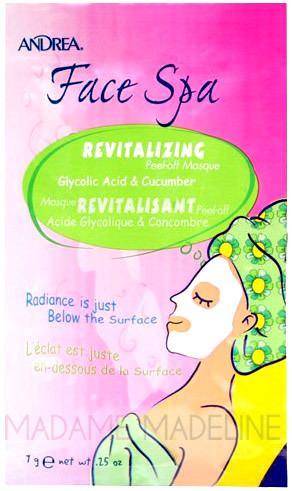 Andrea Face Spa Revitalizing Peel-Off Masque 7g/0.25oz - 1 Packet. Reveal a beautiful new you with Glycolic acid, a very effective exfoliant, renews your skin and treats it to a mini-facial. To Use: Place masque poser in a small bowl or cup. Gradually add 1-2 tablespoons of water, stirring constantly, until mixture holds together but isn't runny. Twice a week, apply to face and throat. Allow to dry thoroughly, 10-15 minutes. Peel downward, starting at hairline until entire mask is removed. Ingredients: Magnesium Carbonate, Diatomaceous Earth, Algin, Calcium Sulfate, Tetrasodium Pyrophosphate, Cucumis Sativus (Cucumber) Fruit Extract, Camelia Oleifera Leaf Extract, Glycolic Acid, Butylene Glycol, Fragrance (Parfum), Diazolidinyl Urea, Iodopropynyl Butylcarbamate.